I come from Halwa city. 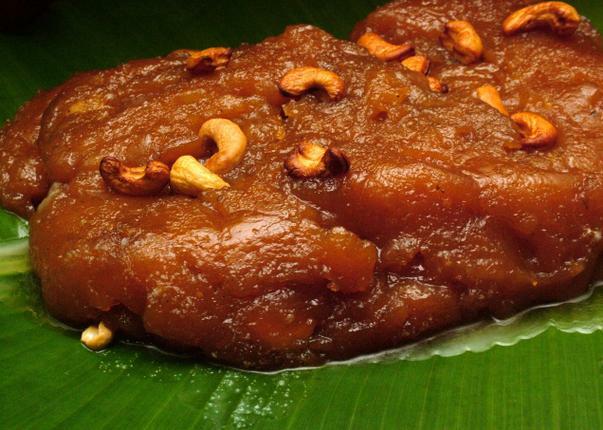 As soon as I say that I come from Tirunelveli, you will also ask me for Halwa like everyone else in the world. I will twist my empty fingers and say I don’t run around with Halwa. I will also promise to bring Halwa when I go home again but I won’t. Bringing just a half or one kg will simply be inadequate to the ants in my cupboard. I don’t know how much to bring back from there. This is a confusion, not a confession. Once when I tried bringing it all the way from Tirunelveli to Bangalore, the grandpa who sat next to me in the train had the nose of a Rottweiler. I couldn’t hide those Halwa packets. When I googled Tirunelveli just to see what it has to say about my home town, I forgot to breathe because I discovered that Amazon is now selling Tirunelveli Halwa. I now understood the meaning of mesmerized. “Nijama?”She asked wondering if halwa could be sold online. The city’s bus stations, railway stations and all the possible places that tourists go to have five to six ‘Santhi Sweets’ shops. And all these shops equally claim that they don’t have branches anywhere else. At this point, women find choosing clothes easier than choosing the correct shop. When all the shopkeepers call you and say theirs is the original your brains will disappear. Men will just give up wanting to buy. Tirunelveli has so many kutti villages whose names are as hard as French names to pronounce. Studying Europe map is easier than studying Tirunelveli map. But let me try – the three places that I know are: Town, Junction and Murugankurichi. Town is where we have the towering Nellaiappar temple, Pothys, RMKV, jewelry shops, whole sale saree shops and other shops. I have no memory of seeing vegetables here. Therku Ratha Vedhi, Merku Ratha Vedhi are the famous streets in town. During the temple festival the chariots are pulled through these streets and therefore they are called Ratha Vedhi meaning Chariot Street but on their bags, Pothys calls it North Car Street. If Ammachi gets bored at home she takes us to the town. For the kids who loved playing with kitchen set, town is the right place. While walking through the streets, the sight of the puny kitchen sets, palich green and red plastic items, petty shops that sell earrings and chains that the heroines wore in hit movie smell like flowers. I say so because there are several garland makers in all the streets but they disappear in the crowd. Town is called so because it is the first part of the city to have gotten commercialized. It is actually very important for me because that is where we get the Iruttu Kadai halwa (dark shop). From the auto drivers to the temple samiyaar everybody forms a queue in front of the shop at 5 in the evening. Finally when the shop opens at 6 with a glow of a single yellow light, the workers begin working as fast as mobile phones to attend to the customers. The sweetmeat is served hot-hot in plantain leaves. Cut the 50 gm Halwa in two with your fingers and swallow them. Feel the hot and sweet running to your stomach. Warning: Everyone’s eye will be on you if you cannot finish this ritual in five minutes. The part of the city that had the railway station is called the Junction. Junction and town were separated by a long shaky bridge, which people tried renovating. Junction is where we see the real ‘Santhi Sweets’. The straight road from the station ends at this shop. People who couldn’t take the crowd of Iruttu Kadai came here to buy it swiftly. This is a shop that runs 24/7 and in times of emergency it is a wise decision to call ‘Santhi Sweets’ because they will surely respond. People with their trolleys and bags do gymnastics while waiting for their parcel packets to come. The golden and yellow lights of the shop are so bright that the sleepy eyes of the passengers also start glowing. Murugankuruchi always stays in my mind because this is the second last line of my address. Hide and seek, temple festivals, cows, dogs, teenage lovers, caste fights, calling bell pranks and the drunk old man who pretended to talk to George Bush over the phone loudly in Tamil on the streets every time he was tight – are some of the things that I will always remember. To me Tirunelveli is Parotta and Chalna (gravy made from beef soup). I miss Amma’s Dosa, Fish curry and Biriyani but Parotta and Chalna is what I starve for. Parottas are meant to be torn neatly and now I’m so adept at doing it that they look chopped with knives. Then I pour chalna over the small pieces of parotta. I wait patiently while the parotta gets soaked in the chalna. And when I cannot take it anymore, I plunge into the plate. French revolution began in France. Industrial revolution began in Britain. And Parotta revolution began in Tirunelveli. A hotel called ‘New Ruchi’ started this revolution. The parotta which was formerly thin, white, and large lost its demand when this hotel began serving parottas which were golden brown, thick, soft and as small as Idli. When they started this in the city market area, the huge aquarium that they had in front of the hotel attracted most of the customers initially. But later the crowd started falling in love with their Parottas. All the road side shops and all the hotels in Tirunelveli adapted this technique from them and started making Parottas in small sizes. When the Parotta is served with omelet, I usually fold the omelet and place it in the middle of the Parotta, and then dip the whole thing in the Chalna. I carefully take this to my mouth to avoid spilling it on my dress and then release it in my mouth. After a good juicy chew of 2 minutes, it would disappear. Beeda – glossy betel leaf stuffed with Gulkand is the best thing to finish the dinner with. If your mouth is as large as mine you can also try this. Like ‘Santhi sweets’, ‘New Ruchi’ is another brand of Tirunelveli which you will find in all the roads and high ways. But they are all the branches of the first one. VOC ground which sits in the center of the city, is an all-time entertainer for Tirunelvelians. Though there are malls and other shopping complexes, the crowd always prefers coming to the VOC ground just to have some masala puri and mushroom soup. Teenage boys sell balloons and other small goodies in their uniform trousers. On the days of kabadi and cricket matches, the ground explodes with people. Boys would sit on top of each other just to watch these matches. Spicy kathirika sambhar, cow dung, dense white gums on the wall posters that smell like boiled rice and smoke from the chimney will hit you at different points when you walk through the streets of the city. Funky jokes that are written on autos, Thirukural on buses, that aunty who cycles in her green nighty, dogs that bark at red cars, street lights that are bright in the mornings and bikes that carry whole families on it are somethings that you will notice. Come to my city with headphone-less ears and sleepless-eyes to see all this magic happening.